When chunks generate, stone can be found under layers of grass and dirt as well as generating as large boulders placed across the surface of the terrain. It can also be seen exposed at the side of mountains and cliffs. Mining raw stone with a pickaxe will drop rocks instead of the block, so obtaining it does require a special technique. To obtain a raw stone block, you must destroy every orthogonally adjacent block so that all six faces of the raw stone block are open to the air. As shown in the graphic above, you must remove the 6 blocks touching the raw stone. You do not need to remove the diagonal blocks, though it may be necessary to do so to reach the ones that must be removed. When you have successfully removed the last of the 6 blocks, the raw stone will drop as an item you can pick up. Stone generates in three separate vertical layers. Sedimentary can only be found on the top layer. Metamorphic is found in the top and middle layer. Igneous Intrusive and Extrusive are found in all three layers. Each layer is independent of the others in regards to where it changes specific stone type, so a change in the stones on the surface does not necessarily mean a change in the stone of either of the lower two layers. Breaking a stone block with a Pickaxe yields 1-2 Rocks as well as a chance to drop a Gem. 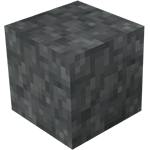 By using a hammer on the top of a raw Igneous Stone block that is in of its natural spawning layer, you will open the anvil GUI, where you can weld copper ingots. Using a Chisel in smoothing mod on stone will create Smooth Stone. Ores & Minerals generate by replacing the appropriate stone blocks. Each stone type is capable of spawning different specific ores and minerals upon world generation. These capabilities can be used as a basic prospecting mechanic. For example: Garnierite can only spawn in Gabbro, so there is no point mining in other stone types searching for it. WARNING: Mining the underside of a stone block may cause it to turn into Cobblestone and trigger a cave in! Avoid digging up whenever possible and remember to use Support Beams when you must dig up. cavein options Options which affect cave-ins. Chance that when you mine a block it will start a collapse. For example, if the number is 40 then there is a 1 in 40 chance of a collapse occurring. The minimum number of solid blocks that must be over a open section in order for it to collapse. You can think of this as the weight of stone required over an open block before a collapse becomes possible. When a collapse occurs, each block within a random range of the initial one will be given this percentage chance of collapsing as well. Raw stone drops cobblestone when destroyed by an explosion. Mining raw stone drops rocks instead of cobblestone blocks. Changed creation of stone anvils to right clicking on the top of a raw stone block with a hammer. Turns raw stone into a temporary stone anvil as long as the GUI is open. Stone anvil creation is no longer tied to the dominate rock layer but the Igneous Intrusive/Extrusive restriction is back in effect. Stone drops 1-2 rocks instead of 0-3. The underside of a stone block cannot be chiseled if the block above it is also stone. This is to remove an exploit that was used to prevent cave ins. A boulder made of raw stone sitting on the surface. A cross section of the world showing the change in stone layers. This page was last modified on 25 October 2014, at 02:11.